If you’re the parent of a school-age child in Canada, there’s a very good chance you’ve had to think twice about allergic reactions to food — even if your own child doesn’t have allergies. Perhaps you’ve dropped your child off at school with a sandwich or snack, only to find out later that your well-intentioned food item may have put a classmate at risk of a severe allergic reaction. While planning a birthday party or playdate, you may have even been contacted by the parent of a child with allergies — with special instructions for safe meal planning. The reality is that 6.9 percent of children and 7.7 percent of adults in Canada self-report being affected by food allergies, and one in two Canadians knows someone with a serious food allergy. 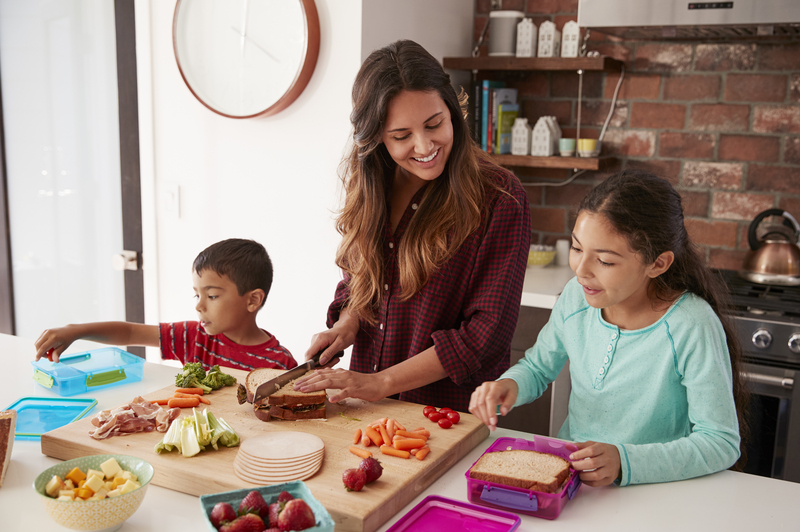 Since most fatal food-related allergic reactions are caused by food consumed outside the home, it’s essential that we all have a general understanding of allergies and safe food preparation practices — so we can eat and share food with peace of mind. Your immune system protects your body by detecting and destroying germs, but occasionally it can mistakenly attack something harmless. When you have a food allergy, your body mistakes harmless foods for something that could make you sick. Your immune system responds by producing defensive proteins (antibodies), which attack the allergenic food protein every time you consume or come in contact with that food. The chemicals released by this process can leave you with a mild skin rash — or even gasping for breath. In the most severe cases, allergic reactions can even be fatal. Substances most frequently associated with food allergies and allergic-type reactions are often referred to as priority food allergens. Health Canada offers consumers online information about the Canadian list of priority food allergens. Risk factors: Who develops a food allergy and why? The definitive cause of persistent food allergies in the Western Hemisphere is still unknown, but there appears to be a mix of genetic and environmental factors. First of all, genetics can play a key role in the development of food allergies; you are at a greater risk if allergies are common in your family. Other conditions — such as other allergies, asthma or eczema — may also increase your vulnerability to food allergies. Early exposure to common food allergens is key to combatting the development of allergies in children. In the past, guidelines recommended delaying the exposure of children to common food allergens — peanuts in particular — until after age three. However, experts now believe that early exposure is actually important in the prevention of food allergies. “It has been demonstrated that eating peanuts early could prevent peanut allergy in high-risk infants — those with severe eczema and/or egg allergies. More generally, there is no evidence of benefit to intentionally delaying introduction of any allergenic foods, which can be introduced into the diet of an infant at the age of six months in a non-choking form." Diagnosing food allergies with certainty can be tricky. Since young children may not be able to communicate their symptoms, those around them need to pay extra attention to complaints, discomfort, and other signs of an allergic reaction. Food allergy symptoms — such as nausea, vomiting, cramping, or diarrhea — can also be confused with other conditions, such as food intolerance or even food poisoning. It’s important to differentiate that when your body produces an allergic reaction to what you ate, the immune system orchestrates the process — which can affect your face, skin, and lungs. However, if you have a food intolerance, the reaction is usually focused on the gastrointestinal tract — and does not involve the immune system. Always consult your doctor or an allergist to properly identify if you are dealing with a food allergy, intolerance, or another food-related condition (such as a gluten-related disorder). If you’re not sure of your medical history or if your allergy tests are inconclusive, your allergist may prescribe an “oral food challenge” for a more accurate diagnosis. With strict medical supervision, you will be served tiny amounts of the potentially-offending food, with increasing doses over time, to record any reactions. How are food allergies treated and managed? The old adage, “prevention is better than cure” certainly rings true when it comes to managing food allergies; the most effective treatment is awareness and avoidance of the food that causes symptoms. While that may seem simple, the trigger food may be present as an ingredient in pre-packaged foods. To avoid accidental exposure, it is crucial to carefully read food ingredient labels. In Canada, all pre-packaged foods must clearly label any priority allergens, gluten sources, or added sulfites that are ingredients or components of ingredients in plain language. Cross contamination during manufacturing can also result in the unintended presence of food allergens in pre-packaged food. Manufacturers can use precautionary labelling, such as “may contain” statements, to warn allergic consumers of the risk of cross contamination. Visit Health Canada’s website for more tips on allergen labelling. When preparing food, take special precautions to avoid mixing up allergens with non-allergens. This includes properly washing anything that came in contact with an allergen, since food can accidentally get contaminated during preparation or while serving. Take extra precautions with children that have food allergies. The parents or guardians of children with allergies must notify others — including staff at their child’s school — and explain food allergy symptoms. The school will also require a written emergency action plan, containing instructions on preventing, recognizing, and responding to food allergies. This document should be on hand wherever the child goes, including trips or other activities. An individual with a food allergy is typically prescribed an auto-injector kit, such as an EpiPen®, containing a dose of epinephrine that can be applied into the thigh muscle when needed to treat the symptoms of an allergic reaction. It may be surprising to know that 18 percent of children medically attended to in the emergency department have been reported to suffer recurrent anaphylaxis. This means that in some cases, one injection of epinephrine may not completely address symptoms, which can reappear in the first 24 hours. That’s why it’s important for individuals to seek emergency medical treatment and follow-up care. Scientists are still developing and testing several therapies to stop allergic reactions, including oral immunotherapies and protocols that rebuild tolerances to the food allergen. In the meantime, it’s important for allergic individuals — and those in their surroundings — to be aware of the presence of allergens in food products. That way, we can enjoy the sense of community that comes with sharing food together — without fear of an allergic consequence. Priority allergens: tree nuts, peanuts, sesame seeds, wheat and triticale, eggs, milk, soybeans, crustaceans, shellfish, fish and mustard seeds.